It’s a showdown here, folks. Two serious contenders, abstraction vs. realism. We’re facing off today in Austin, TX on the field of High Yellow, speaking to Mr. Ellsworth Kelly. Pitting our need for representation against his refusal to represent. Gear up and let’s get it on. Winner takes all. Us: This is a minimalist landscape, the green is grass, the blue is sky and the yellow is that scorching beast of a Texas sun. Kelly: This is greenness, this is blueness, this is yellowness. Us: Ok, then. This is the yellow ball that finally scored a hole-in-one at Peter Pan putt-putt golf in seventh grade. The night I finally kissed Bethany Mulhaney. Us: No fair, you’re using my distrust of simplicity against me. It’s complicated you know. Us: This is about the possibility of purity, of perfection – both impossible in life. This highlights the ironic equation of the cosmos, that blue + yellow=green, every time. But in life inputs rarely equal outputs, anytime. This is a bridge where representation walks over into abstraction and surrenders to the veracity of color. Kelly: LOL, this is so simple that it takes a genius to figure it out, huh? Us: You really gonna trash talk me about this fat egg painting? I hear the thwang of Cupid’s arrow near and offer up my favorite painting of love as a target for today’s discussion– Thomas Hart Benton’s Romance, on display at the Blanton Museum in Austin, Texas. I’m immediately drawn to the intense turquoise blue of the sky, embraced by the tree branch and her vibrant poppy red dress. The statuesque couple contrasts with the dream-like landscape surrounding them. They walk, hand in hand, eyes closed. The the moonlight casts its spell; wafting clouds swirl to the ground. I’m again caught up in the depth of the jewel-like colors intensifying this dreamy, atmospheric feeling (almost Surrealist with echos of El Greco). His shoes are off, hers are on. Is this a new romance? Are they courting, walking though a neighbor’s backyard, blind to each other’s faults (love is blind)? Each experience intensified yet dreamlike in the thrall of eros. Their feet don’t seem to be firmly planted on the ground. Or is this an old love, deep and unscarred by time and circumstance. What they have is beyond sight, a heartfelt soulfulness. At peace with each other. Such that they know each other’s thoughts. The hard work of running their farm, a silent testament behind them. Do they walk side by side, even in their dreams? The mystery here is the mystery of love. What drives it. What sustains it. How we get it; how we keep it. It’s a million immutable questions that must be answered one at a time. With our eyes closed. Recently, one of my helpful in-laws (who shall remain anonymous) charred my favorite stock pot, while cooking in my kitchen. . . reminded me of Josefina’s piece (my fav) at the Blanton Museum in Austin, Texas. I’ve been scrubbing my sad pot for days, and it occurred to me that I could simply choose another from these shelves and chuck the whole mess. So choose mug, take a seat, and I’ll pour you a cup of La Vigilia. La Vigilia (Vigil), a collection of seventy-two oils, each tucked into a cubby of twelve Ikea style bookcases. 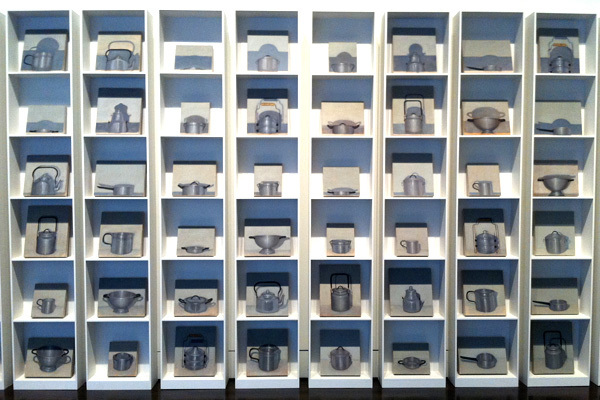 The twelve different pots and utensils are life-size, each painted six times with a different perspective/shadow. Each perspective corresponds to the height of the shelf it sits on. And here comes the fun part. The shelves themselves cast shadows that banter with the painted shadows on the canvas. A cozy-intellectual, game of shadows. A Puzzle of pots. Painting. Sculpture. Shadow. This piece speaks of “home” to me and warmth, although it reads grayscale. Intriguing. These normally utilitarian items, carefully elevated and precisely glorified en mass. For each one, memories of my steam-kissed mother or grandmother, stirring. Spoons tasting over the stove, back and forth checking the oven. My grandfather’s sink vigil, baptizing dishes, washing their stain away. And I contemplate the meaning of home. What makes us leave it, what draws us back from far places. Memories like water, fill these vessels. Which pots do we keep of our “home” which do we forge anew. Arranging new values with old traditions in our own family’s collage. And then the shade Time wields its brush of shadows. In honor of my dad’s birthday today, I will highlight something near and dear to his heart. Western Art. As a kid, he often schlepped me to the Amon Carter Museum of American Art in Fort Worth and I now recall those trips fondly. He’s an artist himself, wiling away at his craft in a snug little cabin in Colorado. Dovetailing with his passion is the Blanton’s new exhibition, Go West! Although this collection is small ball (4 rooms) compared to Amon Carter’s, it’s arranged in quite an orginal way. The paintings chronologically trace the development of the west starting with the pristine west (Hudson River Valley school), through the Indian conflicts, the Indian plight, finishing with modernization (cattle and oil). Coming soon, is a contemporary exhibition, to showcase modern art with western influences. To the right is Oil Field Girls, by Jerry Bywaters. A moving rendition of what happened to the pristine west as the oil fields overtook. You see the smoke clouds staining the sky and the young women, their bags packed are trying to get the hell outa Dodge. The irony is not lost; the west used to be a place to escape to start a fresh life. Now, they are leaving it in the dust. Below is the collection’s huge showstopper, by Fredric Remington, another all time great of Western art. Donated by Mrs. Ima Hogg, the “first lady of Texas” (rumoured to have a sister named “Ura Hogg” –but she only had brothers). Only in Texas, people. Who’s there? A lovely burst of warmth for you today. The sun has opened her door this morning and offers something bright to cheer you in these wetcold days of winter. Come on in and settle down with this Norman Lewis called La Puerta del Sol. Sun’s door. I love the fresh lavender and honey-golden yellow in this canvas. It’s friendly and inviting. I see an echo of his native Harlem here in the energy and vibrance of the colors peeking though the shining sunsnow blanket. My granddad loves to mix honey and butter together and spread it over toast. I think you could just take your spoon, scoop out a little dollop of this painting and spread it over your toast for a bright sweet-eyed morning treat. Mmmm. . . Cheer up my friends, spring is just around the corner! Sun’s door is soon flung open. In keeping with the theme of transforming trash that I spoke about in yesterday’s post on El Anatsui, here is Paul Villinski’s Passage, currently on display at the Blanton Museum. Each butterfly (1000 strong) is hand crafted from discarded beer cans, found on the streets of New York; many species – all anatomically correct. Seeming like carbon-copies, but each unique. They swirl around a glider model spanning over 20 feet, made of old pallets and other discarded wood. The joining of the two is ethereal and intriguing. The juxtapositions are fresh. The usually delicate butterfly is now made of metal, aluminum. In nature, gossamer and light, but like metal, withstanding journeys of a thousand miles. Fragility’s strength. The glider seems motionless, while the butterflies have a sense of purposeful movement. Moving in stillness. The fascination of flight – both manmade (symbolized in the glider) and natural (the butterflies). Is the plane carrying along the butterflies as they swirl around its skeleton? Or is it they, who are navigating, buoying the plane on the breeze of a thousand wings? This shimmering textile sculpture, is actually thousands of metal whiskey labels that the African artist, El Anatsui, has painstakingly “sewn” together bit by bit with copper wire into a quilt of shining color. These pieces are monumental in scale; one was even draped over a building facade. The sheer magnetism of the metal tapestry draws you to study the intricacy of its construction. It’s then that the power of the “weaving” hits you. Like the rich colors playing with the light, I think of many things. The painstaking and creative construction. This is a humble piece of trash here. Folded, twisted, made into rectangles, squares, circles and joined together by hand, one by one. The enormous number of labels. Soooo many of these liquor bottle labels, the ubiquity of them, suggests the people in Ghana and Africa, are drinking a lot of whiskey. The labels are in English, not African languages, so this whisky is imported from abroad and whispers of imperialism and the immense sadness it has wrought on Africa. However this grief sounds more like a deep throb in the heart of this piece rather than a shout of anger. This “trash” is transformed. The sum, greater than its parts. We are all part of this cloth. Each one, a piece in a shining whole. The inter-connectedness of us all. The power and diversity of the African spirit / human spirit – a glittering tapestry (despite the drunken folly). The light plays with the waves and folds in the metal cloth and mesmerizes you. They drape and change with each installation, giving it new life. The light reflects and scatters into a thousand mirrors. I imagine it taking a mystical quality like a magic carpet or a waving banner of hope.